Begin by warming your cast iron skillet and heating the oil on medium high heat. medium low while melting your bacon grease and coconut oil. After the oil is heated, place bell pepper ring flat in pan. Allow to cook for a few minutes, then flip. 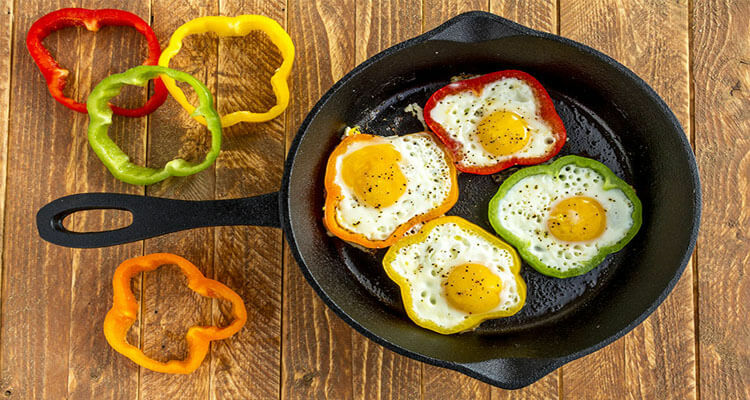 Crack egg open into cooking bell pepper ring, press down on ring with a spatula to minimize egg spreading to pan. Allow egg to cook to desired wellness, salt and pepper to taste. Remove eggs from skillet. Top with salsa, goat cheese, or crumbled bacon if desired. Side Suggestion… Serve with tomatoes and cucumber.